A roundup of Saturday’s NCAA men’s hockey tournament action, which featured North Dakota and Boston College advancing to the Frozen Four. The first two tickets to the Frozen Four are punched. North Dakota and Boston College are headed to Tampa, while four teams will fight it out Sunday for the final two spots. Here's what happened on Saturday, the busiest day of the NCAA tournament. As only one of two No. 1 seeds remaining, North Dakota knocked off Michigan to advance, and will now play the winner of Ferris and Denver on April 7 at Amalie Arena in Tampa. North Dakota’s five-goal day against the Wolverines was an encore act to its six-goal game against Northeastern the day before. Drake Caggiula started the day’s scoring late in the first period when he followed up on his initial shot and slid a rebound behind Steve Racine. Michigan answered five minutes into the second period, when JT Compher scored from the high slot. Then in the final minute of the second period, Luke Johnson capitalized on a bad Michigan turnover to put the Fighting Hawks back ahead. Compher again answered by starting the scoring in the third period. But that was the last time anyone from the Maize and Blue scored as Rhett Gardner, Coltyn Sanderson and Paul LaDue all tallied, putting the game away. This will be North Dakota’s 22nd trip to the Frozen Four and its third straight. However, it has not been to the championship game since it lost to Denver in 2005. This Frozen Four trip will be No. 25 for the Eagles, as they edged potential Cinderella Minnesota-Duluth to earn a trip to Tampa. It wasn’t without some late drama though, as the Eagles, who went up 3–0, had to hold off the Bulldogs, who scored two late goals in the third period to make things interesting. 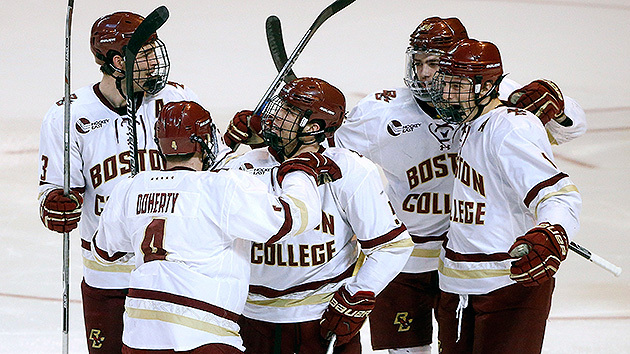 BC’s Teddy Doherty racked up the game’s first two goals, one in the first and one in the second, while Ryan Fitzgerald scored what would be the game-winner 6:35 into the third period. With just over seven minutes remaining, the Bulldogs were able to break Thatcher Demko with a goal from Austin Farley. Three minutes later, Karson Kuhlman scored. But the Eagles hunkered down and are now off to their third trip to the Frozen Four in the last five years. BC, which has not missed the tournament since 2009, will try to win its third title of the decade (with championships coming in 2010 and '12). It will play the winner of UMass Lowell and Quinnipiac. Overtime was needed, but it didn't take long, as Ferris State became the second four-seed in the tournament to knock off a one-seed thanks to Jared Van Wormer’s tally just 18 seconds into the extra period. The goal was VanWormer’s second of the day and capped off a three-point night in which the Bulldogs held off a late comeback bid by St. Cloud State. The teams scored within 20 seconds of each other early in the first period. Then VanWormer lit the lamp with less than 30 seconds to play in the first to give Ferris State a 2–1 lead at intermission. Just 1:04 into the second period, Ferris State’s Kenny Babinski put the Bulldogs ahead 3–1. The Bulldogs carried a 4–2 lead into the the third period, but the Huskies scored twice thanks to Mikey Eyssimont and Joey Benik. Eyssimont finished the day with two goals, but it wasn't enough for St. Cloud State. The Pioneers had the scoring touch on Saturday night as they collected the most goals in the tournament so far to beat BU, 7–2, for a shot against Ferris State in the West Regional final on Sunday. The seven goals came from six different players. Will Butcher scored twice, once in the second and once in the third. It took a while for Denver's offense to get started, but after its first goal of the night 14 minutes into the first period, it went on to score four goals within 10 minutes—and six unanswered goals before Danny O'Regan broke the shutout 12:45 into the third period. The Terriers offense struggled all day, recording merely 21 shots on Tanner Jaillet. BU also went 0-for-2 on the power play while Denver went 2-for-4 — with both goals by Butcher. Denver's clash against Ferris State for a trip to Tampa will happen at 5 p.m. on Sunday. The No. 1 seed is moving on. The Bobcats defeated the Tigers, 4–0, to advance to Sunday’s East Regional final. Another huge win for Quinnipiac was getting Sam Anas back. He had been questionable since the ECAC Tournament. Anas tallied an assist in the victory. Quinnipiac’s Travis St. Denis started the evening’s scoring at 14:55 in the first period, from above the circles on the power play. After a silent second period, Scott Davidson capitalized on a chance up close 2:27 into the third to give the Bobcats a 2–0 led. Then Soren Jonzzon sealed the deal with two goals later in the period. In addition to Jonzzon’s two-point day, Devon Toews and Tim Clifton had multi-point outings, featuring three assists from Toews and two from Clifton. In the tournament’s only shutout so far, goalie Michael Garteig fended off 34 shots from RIT. In the day’s other overtime game, the RiverHawks knocked off Yale behind their hero Joe Gambardella, who scored two unanswered goals to tie it in the third and win it 1:37 into overtime. The RiverHawks opened the scoring 4:27 into the first period thanks to Michael Fallon, but the Bulldogs answered when Frankie Dichiara scored just over 10 minutes later. Yale’s Ryan Hitchcock was the next to find the net midway through the second period. Gambardella got the equalizer six minutes into the third and then score just under two minutes into overtime to set up a clash between UMass Lowell and Quinnipiac for a spot in the Frozen Four. UML’s Kevin Boyle recorded 35 saves while Alex Lyon made 28 at the other end. UML and Quinnipiac will play at 7:30 p.m. on Sunday. West Regional Final: No. 2 Denver vs. No. 4 Ferris State - 5 p.m.
East Regional Final: No. 1 Quinnipiac vs. No. 2 UMass Lowell - 7:30 p.m.
Boston College vs. Quinnipiac/UML winner - 5 or 8:30 p.m.
North Dakota vs. Denver/Ferris State winner - 5 or 8:30 p.m.
National Championship - 8 p.m.